Galerie Urs Meile is pleased to present Cao Yu, Femme Fatale, the artist's second solo exhibition with the gallery and her first solo exhibition in Europe. Cao Yu continues to expand her oeuvre by presenting a new series of photographic works entitled Femme Fatale, which gave its title to the exhibition and is the artist's first attempt at photography. The experimental nature of Cao's exhibitions stems from I Have an Hourglass Waist - the artist's first solo exhibition at the gallery's Beijing outpost. From video to sculpture, installation to work on canvas, and now photography, her multidisciplinary practice is crucial in challenging the perception of her surroundings, experiences and her role as an artist. Cao’s interpretation is jarring and contemplative for both a new and familiar audience. The exhibition features three larger-than-life, full-length photographic portraits from the Femme Fatale series. The golden frames accentuate their grandiose in a style that resembles eighteenth-century Regence frames often used for portraits of the French monarchs. Instead, Cao’s subjects consist of ordinary, yet distinctive men of different classes caught in the action of urinating in public. Each man reveals his social class, be it the typical white-collar worker looking down on the ground, the drunker shouting and pointing at the onlooker or the corporate executive with his head held up high. None appears to shy away from the gaze of a stranger. Their exhibitionist behaviors match uncannily well with those of the French monarchs. In the work Kneeling Figure, Cao performs the act of kneeling - an ancient etiquette in the Chinese feudal system - on an empty canvas until the canvas is left with two concave voids. The viewers are absorbed by the traces of the artist’s action and baffled as to what is the artist kneeling for and to whom. The Femme Fatale series and the Kneeling Figure reconsider the struggle of power dynamics through time on issues relating to class, gender and tradition. The exhibition will also present a new sculpture work Yeah, I am Everywhere and two marble sculptures: The World is Like This for Now II and 90°C IV. 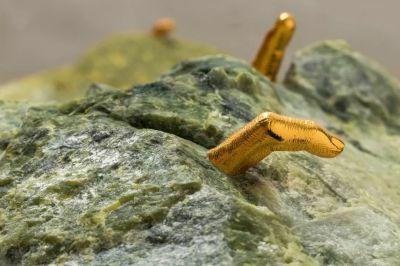 For the artist, stones like marble are usually perceived as lifeless, but Cao purposely inserts objects such as stockings and reproductions of human fingers to breathe life into these otherwise considered silent materials. They represent the ‘pressure in life’, states Cao Yu. For the new sculpture Yeah, I am Everywhere, the artist appropriates a set of green marbles whose color suggests the forthcoming Spring. Rather than the wildflowers emerging from the greens of the blooming spring, Cao implants ten gold plating finger shapes - modeled after the artist's own fingers - onto the green marble. Just like the chaotic wildflowers, the golden fingers represent an infinite, vigorous growth that shines through despite constraints from the outside world, as if shouting “Yeah, I am Everywhere”. The marble sculpture series comments on the omnipresent burden in life but provides a different way of understanding our surrounding. Cao's controversial video work Fountain - previously removed from her graduate show - will be presented with two video works titled I Have and The Labourer. The 11 minute-long video Fountain depicts the artist using her own body as a performative tool to carry out a long and exhausting process of squeezing breast milk until her breasts run dry. The title of the work is a response to the often-masculine association in art history made with works such as Marcel Duchamp’s Fountain and Bruce Nauman's Self-Portrait as a Fountain. The work I Have consists in the artist narrating to the camera while boasting all the positive and envy inducing traits she claims to have, with each sentence starting with: “I have…” The Labourer portrays the act of kneading dough. Instead of using hands and water, the video shows the artist repetitively mixing the flour with her feet and her own urine. The Labourer offers stark visual contrast to the Femme Fatale photography series but shares reciprocal nuances. The gender reversal psychology in Cao's works is reminiscent of a 1906 silent comedy film Les Résultats du Feminisme (The Consequences of Feminism) by French female director Alice Guy, where gender roles have been inverted. It depicts men as childcarer in charge of the household while women drink at cafés while courting men. Cao Yu's autobiographical video works reflect on the notion of gender and social stereotypes. The exhibition greets visitors with an interactive installation on the gallery door handle. The work titled Perplexing Romance consists of yellow Vaseline smeared all over the gallery door handle, towards which each visitor is compelled and tempted but simultaneously irritated by the “perplex” welcome. As one enters, a member of the gallery staff will provide visitors with tissues with the artist's signature to rub their hands clean and then toss them away. Visitors are also encouraged to visit the gallery's washroom as they will encounter a sound installation titled The Flesh Flavour. Composed of a random assortment of bizarre noises that emits recognizable sounds of chewing, sexual intercourses or skin being whipped all originating from an unknown corner of the room, this sound installation baffles visitors with contempt. Back in the gallery space, visitors are bound to access the main gallery space by stepping on an installation work titled The Colourful Clouds, composed of a stack of black-colored bras placed on the gallery floor. Next to the installation is the work The World Has Nothing to Do with Me II, a site-specific installation consisting in a single hair of the artist's passing through two tiny holes carved into the gallery wall. The work often stands unnoticed, just like the opposing forces we encounter in life, which we often ignore as we tend to concentrate on our own personal narratives. The juxtaposition of these two installation works allows visitors to establish a personal connection with the artist’s experience through activating their senses and perspectives. Everything is Left Behind is another new series that will be present on this occasion. The three canvases with Chinese texts rendered using the artist’s hair illustrate the stereotypical comments and opinions forced upon the artist at various stages of her life such as childhood, teenage years, motherhood and being a wife in China. As one steers their eyes towards the other side of the gallery wall, a set of eight canvases with vivid patches of hues brightens the space. Titled after their start and completion dates, since 2012, it is one of the longest ongoing series of Cao's oeuvre. According to the artist, it was the first time that she questioned herself about art. Cao follows the threads on each canvas with sign pens as if aimlessly wandering in a foreign space. Whether in textual or in abstract forms, these canvases record the traces of Cao's path as an artist. There is one prevailing question that Cao Yu addresses her audience: how can art make sense of our seemingly inconceivable society? In the works of Cao Yu, one finds consistent opposing elements in each work, yet the artist seeks to address them from both sides of the spectrum, may it be gender, class, ideology or time. Her multidisciplinary practice provides viewers with a myriad of visual narratives while delving into broader issues in society. Drawing from her own experience, Cao's works reflect on the zeitgeist and attempts to define what it means to be a female, a Chinese and an artist in the current climate. As a female, she addresses issues on gender with the inclusion of the male narrative. As a Chinese, she draws on Chinese tradition and custom in an expansive and contemporary language. And as an artist, she continually challenges her artistic practice and confronts ideas on art, people and society. Her works are not opinionated. Instead, they allow viewers to form their interpretation under an organic process, either through direct physical interaction with a work or by being visually drawn to another one. Viewers are invited to reconstitute the artist's experience through her works and reflect on her surroundings experience as an artist, a wife and a woman in today's society.